Pearland and Dickinson have hooked up in the playoffs in 2014 and 2015 in the area round and the Gators won both games 35-21 and 26-23 (4OT). 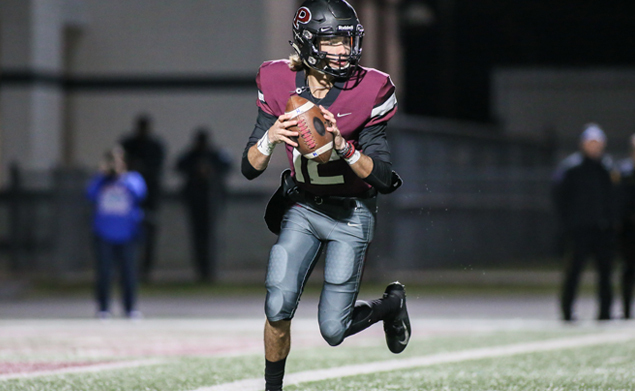 This time the Gators faced the Oilers in the opening round, but the result was still the same as Dickinson dominated Pearland for a 49-21 win to end the Oilers season after posting a perfect 10-0 regular season mark. Dickinson (10-1) will move on to face No. 1 North Shore at Galena Park ISD Stadium on Friday, November 23 at 1:00 p.m. in the Class 6A Region III Div. I area round. North Shore (11-0) destroyed Pasadena Dobie (6-5) in their opening round contest 56-19. The Gators came out firing on all cylinders while the Oilers seemed to struggle on both sides of the ball and never could quite get into a rhythm to really challenge the Gators. Offensively, the Oilers had trouble running passing routes with two receivers running in the same area, dropped passes, and the ground attack was controlled by the Dickinson defensive front. Defensively, Dickinson just had too many weapons for Pearland to defend. Dickinson was led by quarterback Mike Welch who was responsible for six of Dickinson’s seven touchdowns, three of which were thrown to receiver Darryl Harris, who had a fantastic night both in the passing game and as the Gators’ punter, often putting the Oilers in bad field position. The Gators offense played most of the game on a 60-yard field with starting field position at their own 40 or inside Pearland territory while the Oilers struggled to start past their own 20. Pearland was unable to move the ball on their first possession of the game that ended with a sack to force a punt to the Gators. Dickinson capitalized on a short punt with a nine-play, 47-yard scoring drive capped by a 3-yard QB keeper rushing TD by Welch who was 14-for-21 for 278 yards passing for the early 7-0 lead. The Oilers were forced to punt again following the ensuing kickoff and the Gators wasted little time finding the end zone again as Welch fired a pass to Harris (7 catches, 184 yards) covering 47-yards and a 14-0 lead with 2:30 left in the opening quarter. Pearland finally got on the scoreboard mid-way in the second period when quarterback J.D. Head got loose for a 34-yard keeper to the Dickinson 31. Running back Jaelin Benefield got the call on the next play and he broke a tackle and set sail to the goal line to cut the lead in half at 14-7 following the PAT by Caleb Mendez. But, the Gators answered immediately, as linebacker Landon Roque ripped off a 44-yard return on the ensuing kickoff, and two plays later, Jalen Wydermyer made a great grab for a TD on a 19-yard strike from Welch. Dickinson would take a 21-7 lead into the halftime break. At the 8:23 mark of the third quarter, Dickinson would strike again with a long scoring bomb on a 55-yard connection from Welch to Harris, but a blocked PAT left the score at 27-7. The Oilers finally scored in the second half with :24 seconds left in the third period on a 25-yard TD pass from Head to Austin Landry to close the gap to 27-14 after the Mendez PAT. But that would be it for Pearland and the Gators would reel off 22 unanswered points in a dominating fourth quarter that would run the score to 49-14. Pearland scored with 37 seconds left in the game on a 19-yard run by sophomore Torrence Burgess for the final tally to make the final score 49-21. This is the eighth time in Pearland’s history they have finished with a 10-0 regular season record before entering the playoffs. It is the third time that the Oilers have been eliminated in the first round (1962, 2005, 20018) after a perfect regular season. Pearland closes the first-year for head coach Ricky Tullos at 10-1.